I did not have the politeness to visit some the family of my wife, so they come to our house instead. We drink coffee, Eritrean style, which takes a couple of hours. After the coffee ceremony, I do the five kilometer walk to the center. The family disagrees with my walks at noon, when the sun is torturing my very white skin. They want me to sit and rest, and to eat and drink tea with them. I drink the tea, but reject the food. After all these years and many visits, I am still careful with what I eat, and especially with meat. And I should lose some kilo's of weight (which by the way is very easy if you are very active in this climate). I meet Daniel, I friend of Haile and Freweyni. He speaks good English and he is well educated. We talk about the current relation between Eritrea and Ethiopia and the turmoil in Somalia, and the destabilizing role of US foreign policy in an attempt to shape their world order. "Independent political choice will ensure our freedom" is this years Independence Day theme. Daniel explains the theme to me. "We will continue to rely on self-reliance, and will not kneel down for any foreign power that will try to make our economic development dependent upon their control over the East African region, or will try looting our resources, or restrict our freedom". Daniel has a small surprise for me: he invites me to witness the wedding of his brother that will be next week on Sunday May 31. He hands me the original invitation card of his own. "The wedding will be in Tiravolo in front of the church. Freweyni will guide you to the place if necessary." I don't think it will be necessary to guide me. I know the area by now. Haile will continue to try to get me an invitation for the May 24 ceremonies in Asmara Stadium, but I should do my best as well, because he is not sure if he can find me one. On the sidewalk of Semaetat Avenue I buy two packs of chewing gum from an old woman sitting on the pavement with the smallest shop you can imagine. Just a piece of cloth with some merchandise that should give her an income of maybe one dollar per day. I share some of the slices with the military who are guarding the absolute trouble free Independence Day celebrations. The gesture is appreciated. I guess they will remember me. If necessary. I visit my favorite tailor shop. I want them to shorten two pair of pants, and to make me six covers in traditional Bilen cloth for the six cushions decorating my couch at home. It will be a perfect souvenir, and a cheerful memory of Eritrea. I brought one of the covers and the cushion as an example. I give Ali a copy of last years pictures. The staff of the tailor shop and their customers are happy that I did not forget him. With the manager of the shop, I make a calculation for the three meters of cloth and the six zippers. I am sure I could have made a better bargain, but who cares? I am happy with my tailor made souvenirs, and happy to share a few hundred Nakfa's of my wealth with them. The shortening of the trousers is free of charge. A small gift for me. The cultural program in Cinema Odeon is not very different from yesterday's show. Different singers and dance, different drama performances. But the event is eye wettening if you love Eritrea and are in the lucky position to witness the Eritrean culture from one of the front rows of the Cinema Odeon. 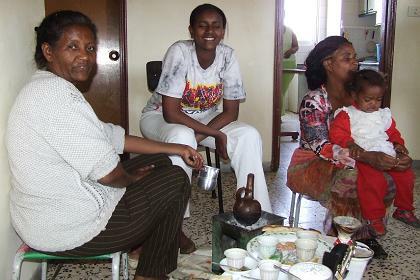 Coffee ceremony with Almaz, Eden and Jordanos - Asmara Eritrea. 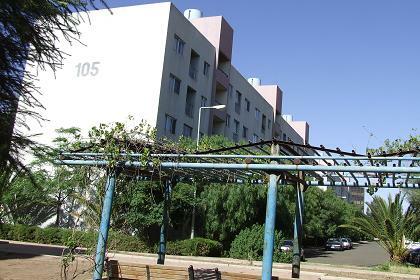 My temporary residence - Corea Housing Complex Asmara Eritrea. 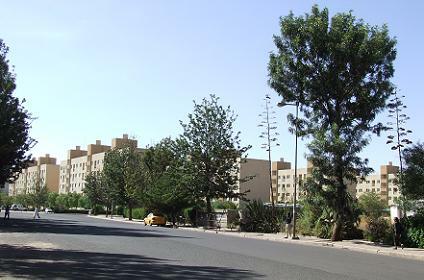 Residential buildings - Corea Housing Complex Asmara Eritrea. 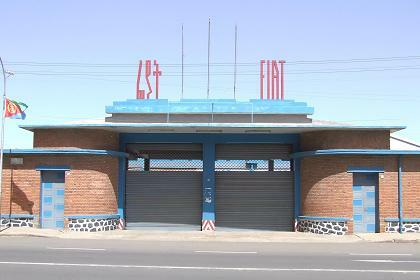 Fiat Garage - Warsay Avenue Asmara Eritrea. 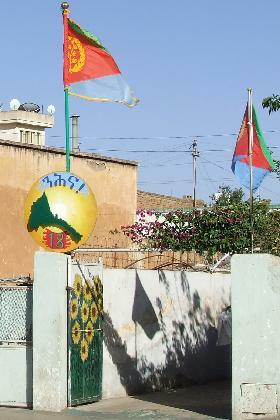 Decorated workshop - Warsay Avenue Asmara Eritrea. 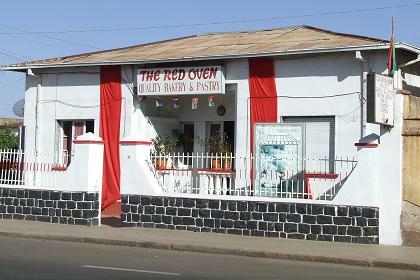 Decorated bakery - Warsay Avenue Asmara Eritrea. 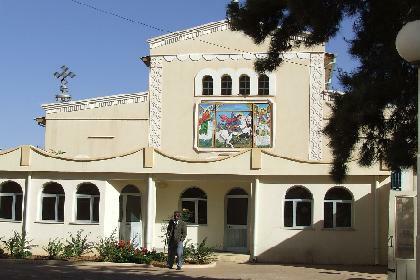 Saint Georghis Coptic Church - Tiravolo Asmara Eritrea. 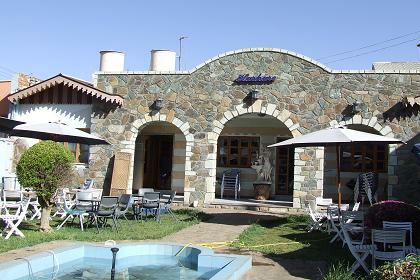 Harhare Fast food restaurant - Warsay Avenue Asmara Eritrea. 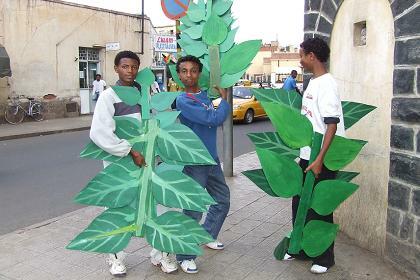 Preparing for the Carnival - Harnet Avenue Asmara Eritrea. 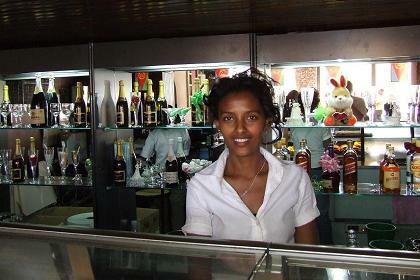 Semhar, Damera Bar - Harnet Avenue Asmara Eritrea. 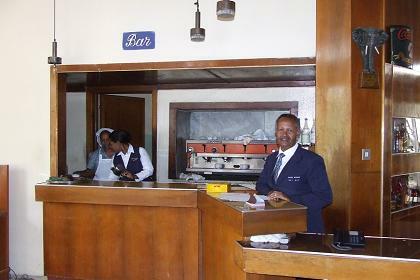 Bar of the Embasoira Hotel - Asmara Eritrea. 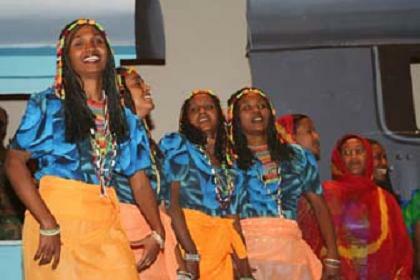 Cultural show - Cinema Odeon Asmara Eritrea. Photo: www.shabait.com.